Click here to read the exclusive SOS review — for free! 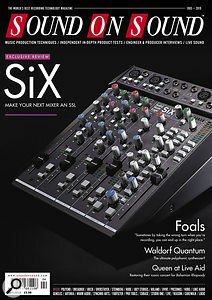 SSL's newly announced SiX compact mixer. Into podcasting? Fancy using an SSL to do it? Until March 20th, 2019, most people wouldn't have said this was a viable scenario — but all of our expectations of what an affordable mixer could be were changed by an announcement from SSL's Oxford headquarters that morning. As any readers of SOS who have seen the April issue will know already, with the announcement came the launch of the smallest and most affordable analogue SSL ever. Less wide and less deep front-to-back than a school ruler, it's compact enough to fit in a rucksack, yet manages to pack in features, including some you wouldn't expect to find on much more expensive mixers. In summary, the new SSL SiX (as it's called) is a desktop-format mixer with (naturally...) six input channels, two of which are fitted with the company's respected SuperAnalogue mic preamps. There's a super-simplified, one-knob version of the SSL Channel Compressor, a new two-band EQ, five 100mm faders and insert points so that you can patch in your own processing. In mixdown mode, there's a 12-channel summing bus, and a two-knob version of the well-known SSL bus compressor, together with a monitoring section that even features the (in)famous 'In The Air Tonight' Listen Mic Compressor on its talkback input. Amazingly for an SSL product, the new SiX will retail for £1198.80 including VAT in the UK$1499 in the US, making it within reach for its envisioned target market in studios, on stage, and, yes... for podcasting.